The Lamborghini Asterion plug-in hybrid concept's design pays homage to the Italian supercar maker's early years as a maker of GT-style vehicles. One model that provided inspiration for the concept was the Miura (inset). Lamborghini design boss Filippo Perini and his team faced a tough challenge when they started work on the Asterion concept. 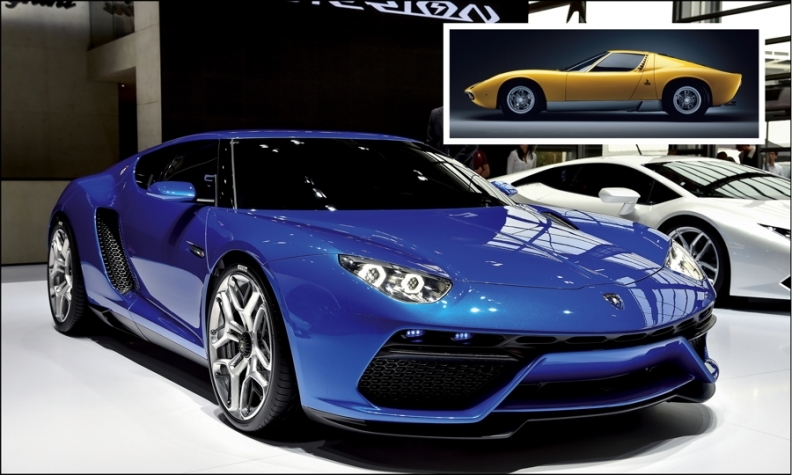 They wanted the Italian supercar maker’s first plug-in hybrid to have a unique look, one that steps away from the angular and aggressive forms of recent cars by borrowing less extreme features from renowned Lamborghinis of the past such as the Miura. “We need to understand if we can open another window in our future to be not so extreme but also a little bit more politically correct and elegant,” Perini said. He said that a key reason for the design shift was that the Asterion rides differently from the Volkswagen Group subsidiary’s current models. The Asterion’s more modern design features include front lamps that utilize high-tech materials such as titanium, forged carbon fiber and aluminum. The new look is woven together with typical Lamborghini design features such as exposed screws and hexagonal shapes. The hexagon treatment is echoed in the composite engine cover and exhaust tips as well as the front grilles and side air intakes, which are double layered to incorporate Lamborghini’s Y-shaped elements, as seen on the rear lamps. The rear of the car also recalls Lamborghini’s history while referencing the supercar maker’s more contemporary vehicles such as Huracan and Veneno, albeit with different proportions. Though the Miura also inspired the Asterion’s three-spoke steering wheel, the interior is very close to the recently launched Huracan, with a horizontal, symmetric dashboard and a longitudinal tunnel that, in this case, houses the car’s battery pack. The air vents, door handles and switches also are shared with Lamborghini’s production supercars. The interior is also a laden with technology such as the TFT screen’s reconfigurable graphics for the car’s different driving modes. There’s also a touchscreen infotainment pad, which can be detached and used by the passenger.